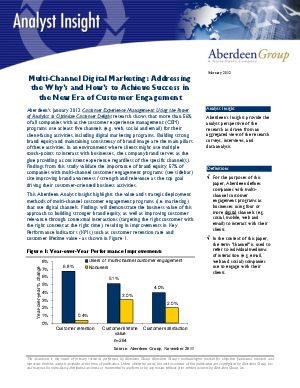 This Aberdeen Analyst Insight highlights the value and strategic deployment methods of multi-channel customer engagement programs (i.e. marketing) that use digital channels. Findings will demonstrate the business value of this approach to building stronger brand equity, as well as improving customer relevance through contextual interactions (targeting the right customer with the right content at the right time), resulting in improvements in Key Performance Indicators (KPIs) such as customer retention rate and customer lifetime value.